Loop and slow down video lessons, including YouTube videos! There are plenty of sites out there that can download a video guitar lesson from YouTube. Keepvid is one example. It’s easy, free and puts you in a place where you have video lessons on your computer. This is all great stuff but what about looping and slowing down the video? Well, this is slightly more complicated. I actually started with just this idea in mind when I first began my online ventures. Unfortunately, to develop the technology cost an absolute fortune and never really worked. That was back in 2006 and luckily, today technology has come a long way. Perhaps the best player in the field is Video Surgeon who with their downloadable software allows you to rip DVDs or even download YouTube videos. Grab a free demo of Video Surgeon here! Once the video is in the software you can slow it down, without changing the pitch as well as zoom in on details. 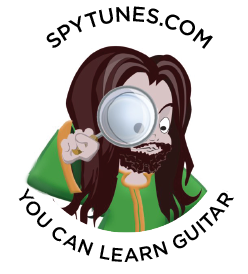 Not only is this useful when you learn Spy Tunes songs, there’s also a wealth of other guitar related material on YouTube that doesn’t actually exist anywhere else! With Video Surgeon you can download these videos and learn them in slow motion! This will ensure you don’t miss a detail and will speed up the learning process enormously.